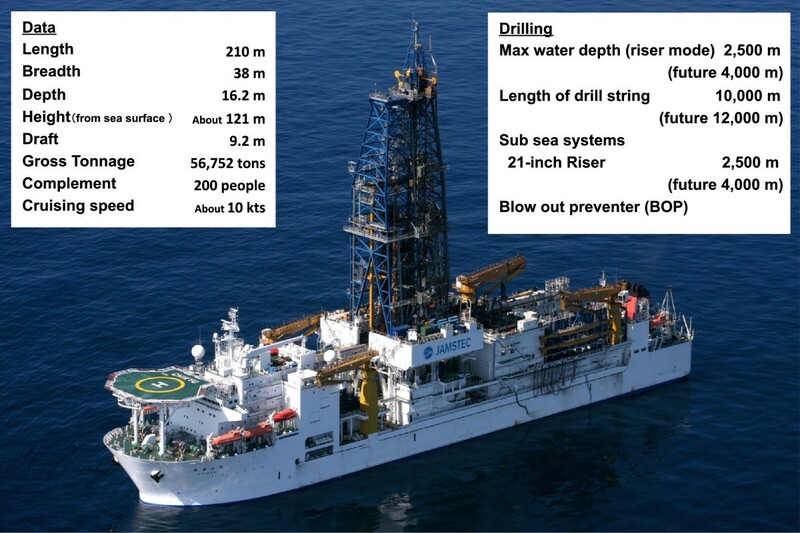 The D/V Chikyu, a scientific drilling vessel, is equipped with industry-standard riser capabilities. Riser drilling technology enables remarkable drilling and downhole logging capabilities and provides unprecedented hole-stability, enabling the shipboard team to retrieve high-quality wire-line logging data as well as well-preserved core samples. The 11 March 2011 Tohoku Oki mega-earthquake and tsunami cost over 18,000 casualties in NE Japan. Chikyu, docked in the Port of Hachinohe, was damaged by the tsunami. By April 2012, the ship was back in operation; drilling the toe of the Japan Trench fault zone where topographic surveys suggested there was up to 50 m eastward motion, the largest earthquake rupture ever recorded. During Integrated Ocean Drilling Program (IODP) Expeditions 343 and 343 T, Chikyu drilled 850 m below sea floor (mbsf) in 6,900+ m water depth and recovered core samples of a highly brecciated shear zone composed of pelagic claystone. A subseafloor observatory looking for temperature signatures caused by the fault friction during the earthquake, was installed and later successfully recovered. The recovered temperature loggers recorded data from which the level of friction during the mega-earthquake slip could be determined. Following Exp. 343, Chikyu began IODP Exp. 337, a riser drilling expedition into the Shimokita coal beds off Hachinohe, to study the deep subsurface biosphere in sedimentary units including Paleogene-Neogene coal beds. New records in scientific ocean drilling were achieved in deepest penetration (drilling reached 2,466 mbsf) and sample recovery. Currently Chikyu is conducting deep riser drilling at the Nankai Trough in the final stage of the NanTroSEIZE campaign. During the years 2011 to 2013, including drilling in the Okinawa Hydrothermal System, Chikyu’s operational and scientific achievements have demonstrated that the ship’s capabilities are vital for opening new frontiers in earth and biological sciences. In 2007, the Drilling Vessel (D/V) Chikyu debuted as the first scientific riser-drilling capable vessel in the Integrated Ocean Drilling Program (IODP). Deep and difficult to reach IODP scientific targets, such as the plate-boundary seismogenic zone, Moho and uppermost mantle, and deep sedimentary sections theorized as the limit of the deep biosphere, all demonstrated the need for a riser drilling system. The initial drilling program, the Nankai Trough Seismogenic Zone Experiment (NanTroSEIZE), targeted a transect offshore of the Kii Peninsula, Honshu, Japan, where the Philippine Sea Plate subducts at the Nankai Trough at a rate of 4 cm per year. The transect included sites on the incoming plate, the deformation front to the mega-splay fault that might have been responsible for the 1944 East-Nankai Earthquake (Mw.8.1) and tsunami , and in the Kumano Basin. The last 7 years have witnessed both difficult and challenging periods of operation for Chikyu, but also achievements of remarkable scientific successes. Technical challenges have included: riser-drilling within the high-speed Kuroshio current, and riserless ultra-deep water drilling in the Japan Trench after the Tohoku earthquake and tsunami of 11 March 2011. This paper briefly reviews the recent operational and scientific achievements of Chikyu. Plans to construct a riser-equipped scientific drilling vessel in Japan began in the early 1990’s. This effort was driven by the keen societal benefit of investigating earthquakes and volcanoes in Japan, one of the most geologically active regions of the planet. Plans were accelerated after the 1995 Hanshin-Awaji Earthquake, which struck the city of Kobe and vicinity, causing more than 6400 casualties. Ship construction was completed in 2005; the Chikyu’s technical specifications are shown in Figure 1. Photo and specifications of D/V Chikyu . 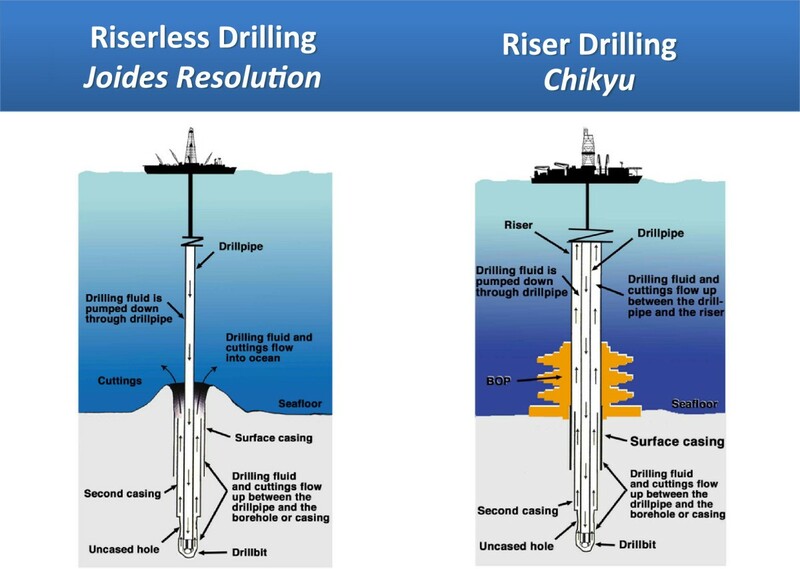 The Chikyu is the only scientific drilling vessel afloat with riser-drilling capability. Experience from previous scientific drilling, aboard the Glomar Challenger and JOIDES Resolution, underlined the difficulty of drilling deeper than 2,000 m below the seafloor because of collapse and otherwise poor hole conditions. The additional potential risk of penetrating hydrocarbon zones in deep sedimentary sections also precluded riserless drilling; the Chikyu was built to overcome these difficulties and provide opportunities to expand scientific frontiers. Riser-drilling technology is designed to maintain a closed-loop circulation of heavy drilling fluid (often called drilling mud) between the borehole and the ship (Figure 2). The drilling fluid is mainly composed of bentonite, barite and polymers, effective in pressure control at the drill-bit, and prevents hole-collapse by coating the wall of the borehole, and effective removal of cuttings produced by the drill bit. Schematic illustration of riser vs. riser-less drilling technology. Riser drilling circulates heavy drilling fluid (drilling mud) in order to control pressure, prevent borehole collapse and clean out cuttings. Riser-less drilling has limited capability for borehole control. At the seafloor, a blowout preventer (BOP) is deployed on top of a pre-set conductor pipe and wellhead. The BOP is comprised of a stack of hydraulic valves, which can mechanically seal off the outer column outside the drill pipe in the event of a hydrocarbon oil or gas leak, and in the case of a real emergency, can seal off the entire pipe. Riser drilling and the BOP are essential technology when drilling into high pore-pressure and hydrocarbon-charged environments. Development of high temperature drilling and logging technology. These challenges must be combined with the establishment and improvement of various analytical technologies installed in the on-board laboratory. These include mud-gas monitoring, creating a cuttings cookbook to standardize scientific usage of cuttings, operating large diameter wireline logging tools (e.g., Modular Formation Dynamic Tester; MDT), and long-term observatory installation, all of which have been successfully implemented and have produced important scientific results. 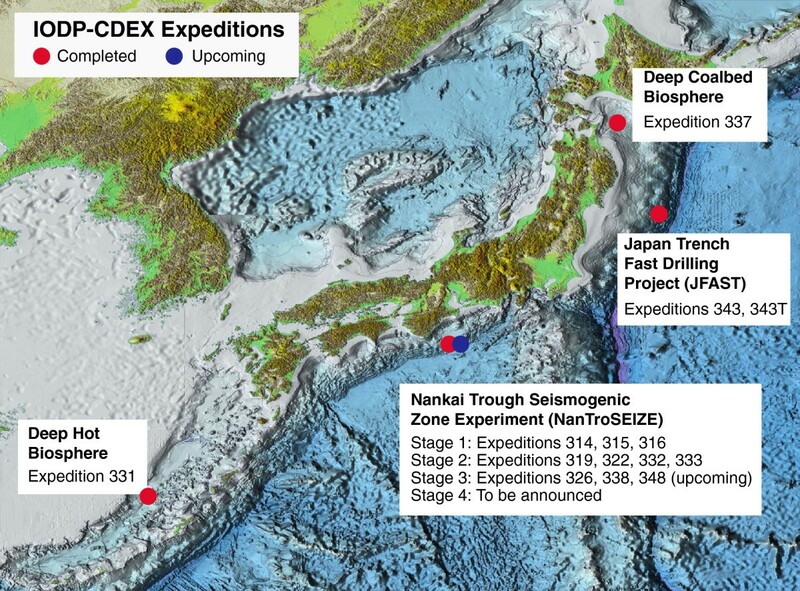 Chikyu’s IODP Expeditions have so far focused on four areas: the Nankai Trough, the Okinawa Trough, the Japan Trench, and Hachinohe-Shimokita (Figure 3). Chikyu expedition drilling locations from 2007 to 2013. Note that NanTroSEIZE includes over 10 expeditions, the largest drilling campaign ever conducted in the history of scientific ocean drilling. Vitrinite reflectance evidence for frictional heating of splay fault and toe of décollement []. Nankai transect drill sites are also shown. Below, we review the representative scientific and operational achievements of these expeditions. The Nankai Trough is an area of repeated occurrence of mega-earthquakes and tsunamis every 100-200 years (e.g., ). Historical records on earthquakes and tsunami date back to the 7th century; the only place in the world that such a long-term seismo-tsunami cycle has been documented. The last earthquakes/tsunami took place in 1944 (East-Nankai Earthquake: Mw 8.1) and 1946 (Nankai Earthquake: Mw 8.4). Tsunami inversion studies of the East-Nankai Earthquake have shown that the rupture zone extends from depths of about 20 km to 5 km on the subducting plate boundary ; this shallow region was considered accessible by the Chikyu’s drilling capability . In 2004 a 3D seismic survey was conducted along the rupture zone of the 1944 East Nankai Earthquake. The data clearly imaged the décollement, the splay faults and forearc basin sedimentation patterns . Based on this dataset, the NanTroSEIZE Project Management Team (PMT) developed a strategy for a 5-year drilling campaign. The drilling strategy of the NanTroSEIZE was divided into four phases: (1) reconnaissance of lithology, structural framework and geotechnical properties of the shallower region of the megathrust; (2) medium depth riser drilling; (3) deep riser penetration into the seismogenic zone; and (4) long-term borehole observatory installation  (Figure 4). The drill sites are mostly located near the axis of the Kuroshio Current, which complicates riser operations because of the 5+ knot velocity which causes current-induced vortex vibration of the riser joints. Some of these issues have been overcome by the Center of Deep Earth Exploration (CDEX) of Japan Agency for Marine-Earth Science and Technology (JAMSTEC) by deploying faring fins around the riser joints combined with real-time riser motion monitoring and fatigue-life models, which were constructed after careful analysis of riser dynamics [5, 6]. Among the various important scientific achievements, we highlight the discovery of a frictional heating event at the very shallow part of the splay fault and at the toe of the décollement in the Nankai Trough. A vitrinite reflectance analysis by Sakaguchi et al. found evidence of thermal events and inferred high-speed seismic slip in faults at shallow depths (less than 500 m below seafloor) in the frontal thrust. Since unconsolidated water-rich sediments at the deformation front are expected to behave as velocity-strengthening material  and inhibit earthquake generation, the evidence for high-speed slip started vigorous discussion suggesting that seismic behavior of accretionary wedges in subduction zones needs to be revisited. A long-term borehole observatory was installed and connected to a submarine cable network system (DONET). Real time data from a strainmeter, a tiltmeter, accelerometers, geophones, a broadband seismometer cemented in the formation are transmitted to a dedicated data collection center on shore. Also, pore pressure at multiple levels and formation temperatures are also continuously monitored in real time . Accumulation of both real-time surface and subsurface geophysical data will help open a new frontier of research on the dynamic behavior of subduction zones. At the same time, the low noise borehole data provides a useful quality control measure for various real-time earthquake-warning systems. In 2013, the Chikyu seeks a new penetration record of 3,600 mbsf to set the stage for the final NanTroSEIZE drilling target: penetrating the splay fault believed to occur at the seismogenic depth of 5,200 mbsf. Quickly following the devastating disaster of the 11 March 2011 Tohoku Oki Earthquake, the JAMSTEC vessel R/V Kairei visited the epicenter region to map the landward slope of the Japan Trench where pre-earthquake mapping data are available. Comparing pre- and post-earthquake topographic data produced an important result: the detection of an apparent 50 m eastward motion at the toe of the landward slope . Together with evidence for large-scale deformation detected by seismic reflection profiling , this led the IODP community to recommend drilling the toe of the landward slope of the Japan Trench starting in April 2012 (Exps. 343, 343 T). This remarkably fast response drilling campaign was only possible because of: (1) the availability of regional data sets accumulated before the disaster, (2) a community which anticipated this kind of need, and (3) the technical capabilities of Chikyu. The main purpose of this fast response was to measure the temperature anomaly thought to remain after any event of high-speed seismic slip, presumably caused by frictional heating. Simulation models indicated that this thermal anomaly would remain detectable if measurements were conducted within two years of the initial earthquake . Drilling more than 800 mbsf in water depths over 6900 m was not an easy operation . Various technical difficulties and equipment failures plagued the initial expedition (e.g. lost bottom hole assembly, issues with underwater camera near maximum cable extension). Nevertheless, an almost complete set of 850 m of logging-while drilling (LWD) data was successfully obtained. The logging data showed prominent fracturing and identified possible fault zones at around 720 and 820 mbsf. Coring in the next hole focused on recovering samples from the detected fault zones and successfully recovered about 1 m of sheared, strongly deformed clays (Figure 5). These strongly deformed clays exhibit intense scaly fabric indicating that it has accommodated shear displacement and is the core of a major fault. The exact thickness of this zone is unknown, due to lack of core samples directly above and below; however, LWD data and core-lithology suggest that the plate boundary fault zone is less than 5 m thick. LWD profile and lithology of JFAST sites (Holes C0019B and C0019C). A fault zone was identified at about 820 mbsf with a change in resistivity; from this interval sheared mudstone cores were later recovered. Borehole observatory installation was not possible during the initial planned expedition; therefore, considering the importance of the temperature measurements, extra expedition time was allocated to install the temperature loggers in July 2012. These sensors were carefully set at specific depths to span the inferred fault zones and potentially detect the residual temperature anomaly. The entire string of sensors was successfully recovered about 10 months later, by JAMSTEC’s remotely operated vehicle (ROV) Kaiko 7000. The entire operation was supported by strong collaboration between scientists, CDEX engineers and specialists, and JAMSTEC administration. 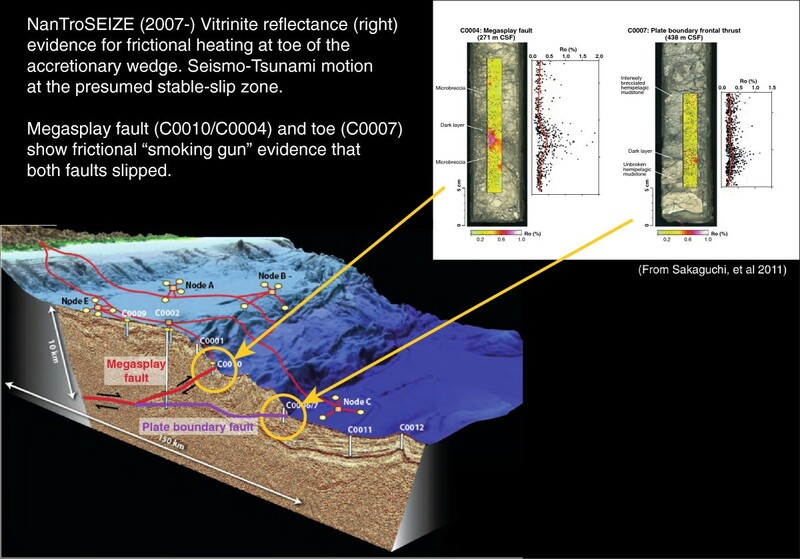 Initial results have been analyzed and publications are in preparation by the science team; we comment on the fact that science outcomes were new and ground-breaking, revealing frictional heating took place at the toe of the plate boundary zone, matching the location detected by LWD and geological samples . Both temperature anomaly analysis and laboratory experiments  showed that the frictional coefficient of fault material is very low (less than 0.1) indicating a very weak fault zone at least at the toe of the décollement. The results from both NanTroSEIZE and JFAST indicate that unexpected high-speed rupture took place at the toe of the plate boundary. This finding suggests we need to re-evaluate our understanding of the mechanical behavior of large-scale plate-boundary earthquakes. Since the historic paper by Parkes et al. , the origin, nature, and limits of the deep subsurface biosphere have been one of the major scientific targets of IODP. Drilling expeditions dedicated to the deep biosphere had previously examined three regions: a region of high organic production (e.g. the Peru Margin; ODP Leg 201, ), a region of extremely low organic production (e.g. the Southern Pacific Central Gyre; ) and a hot hydrothermal region (e.g. the Okinawa Trough; Takai, et al., 2012). Understanding the deep carbon cycle related to coalification and biosphere interaction may be elucidated. The Tertiary coal beds offshore Shimokita-Hachinohe in NE Japan provide a remarkable opportunity to study the coal-related biosphere; the coals are deeply buried (about 2000 mbsf) and the sedimentation could have been semi-continuous with no major disturbances due to prolonged subaerial erosion. During IODP Exp. 337, a new scientific drilling depth record, 2466 mbsf, was achieved. Rotary core barrel (RCB) coring was attempted while circulating heavy drilling mud, and recovered excellent and well-preserved cores  (Figure 6). 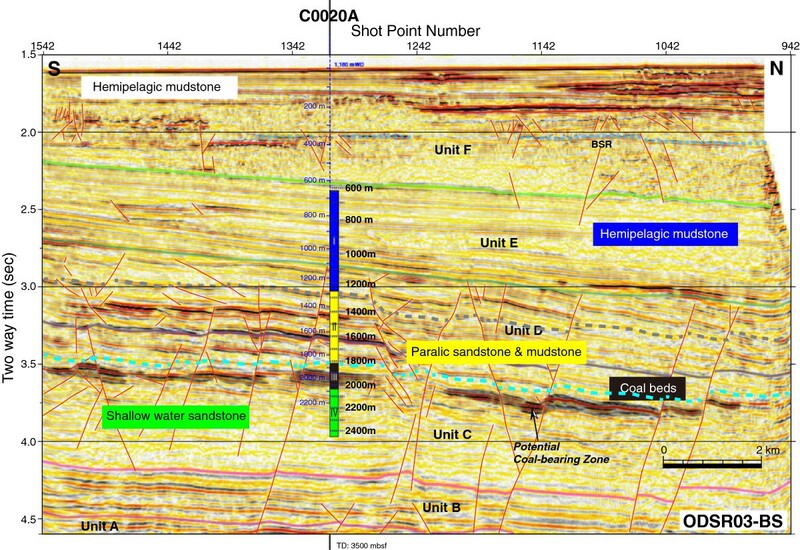 Seismic reflection profile and lithological interpretation of Hole C0020A. Mio-Oligocene coal beds were encountered at around 1,900 mbsf to 2,000 mbsf. The lowermost sections include laminated sandstone, mudstone and coal beds. Shell fragments are abundant in some horizons, indicating very shallow marine to deltaic depositional environments. X-ray CT imaging was especially useful for distinguishing siltstone, organic-rich mudstone, and coal beds (Figure 7). 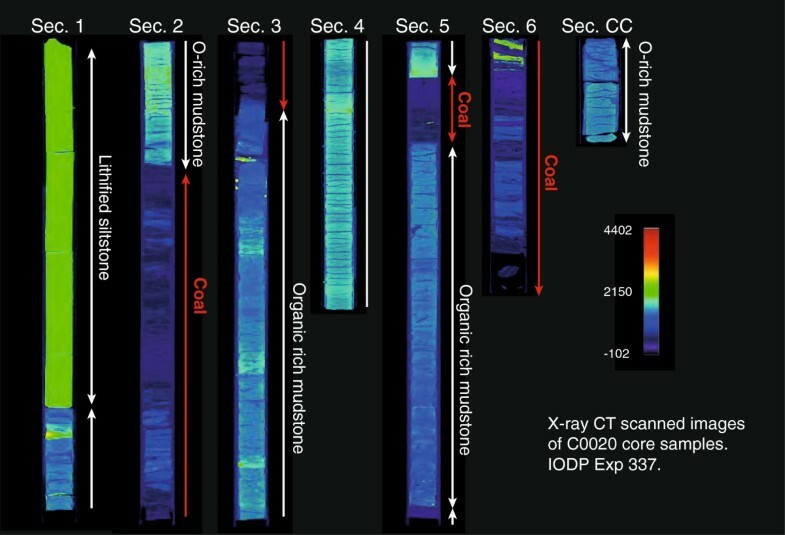 X-ray CT scan image of core below 2,000 mbsf. X-ray transmission characteristics of higher density siltstones, organic-rich mudstone and low-density coal beds are clearly distinguished. Continuous mud-gas monitoring and cuttings analysis were conducted while drilling. Cuttings provided useful biostratigraphic control indicating that the age of coal bearing beds are younger than expected (Oligo-Miocene rather than expected Eocene). Mud-gas monitoring indicated that δC13 of methane below 600 mbsf shows very light values, -60 to -80‰, suggesting continuous biogenic methane production up to temperatures reaching 60°C. Initial data for microbial cell abundance show extremely low counts below 1500 mbsf but higher counts are detected within coal beds . This indicates that 2000 mbsf is close to the limit of the biosphere in normal clastic sediments, but the rather rich biosphere survived within coal beds. These lithology, gas nature, and cell abundance data, together with further analysis on the meta-genomics and single cell biology should provide a new insight into the nature of organisms living at the boundary between the biotic and abiotic worlds. The Okinawa Trough, a 1,000 km long backarc basin of the Okinawa island arc, embraces numerous submarine volcanoes and associated hydrothermal systems. The hydrothermal system in the southwestern part of the Okinawa Trough is characterized by higher concentration of CO2 and formation of CO2 hydrate has been observed (e.g., ). At the same time, the Okinawa hydrothermal system is also unique because of abundant pumice layers that potentially host a large aquifer for hot hydrothermal fluids. IODP Exp. 331 drilled a series of holes along the Iheya volcanic knoll including an active black-smoker chimney site. Technically, drilling in hard and high temperature rocks caused many problems: the bit life was significantly shortened and the regular plastic core liners had to be replaced with aluminum ones. The drilling results revealed three major findings. One is that for the first time in drilling history, saline-hydrothermal fluid was detected. The existence of brine was expected, considering the evaporation of seawater under high pressure and temperature conditions. 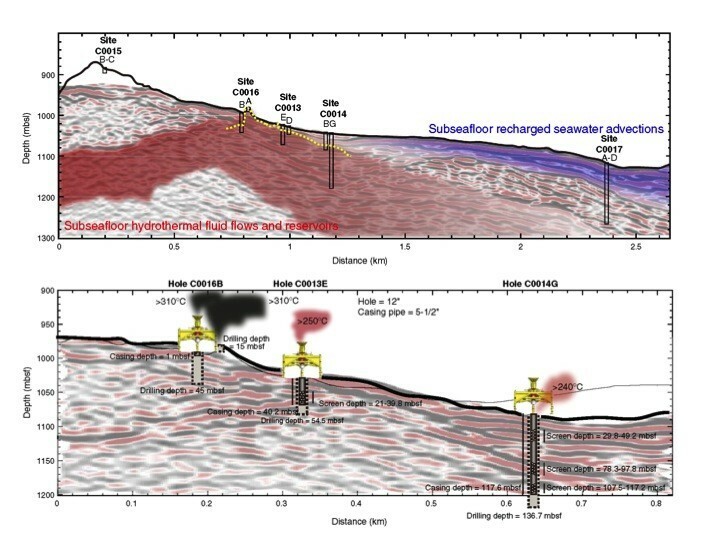 Drilling results suggest the existence of a large pool of hydrothermal water extending 2.5 km horizontally in the subsurface pumice layer  (Figure 8). It is thought that the active black-smoker chimneys are only a surface manifestation of a small amount of fluid leaking from this giant pool. IODP Exp.331 drill sites. Large hydrothermal fluid pool is hypothesized. Artificial fluid venting occurred at three sites and a small chimney was formed . Secondly, a sequence of anhydrite, sulfide metal deposits and silicified altered rocks, very similar to the sequence of Kuroko ore deposits was recovered. The deposition of a Kuroko-like sequence seems to be closely related to the existence of a subsurface hydrothermal pool, indicating the Kuroko-type ore is formed not only in the seafloor chimney environment but also in the subsurface hydrothermal aquifer. Thirdly, newly drilled holes over the hydrothermal pool produced venting of hydrothermal water as black smokers and created a new artificial circulation system. Later observation by the ROV Hyper-Dolphin showed small chimneys had formed on the wellhead and a large community of Shinkaia crosnieri had established themselves on the surrounding seafloor. 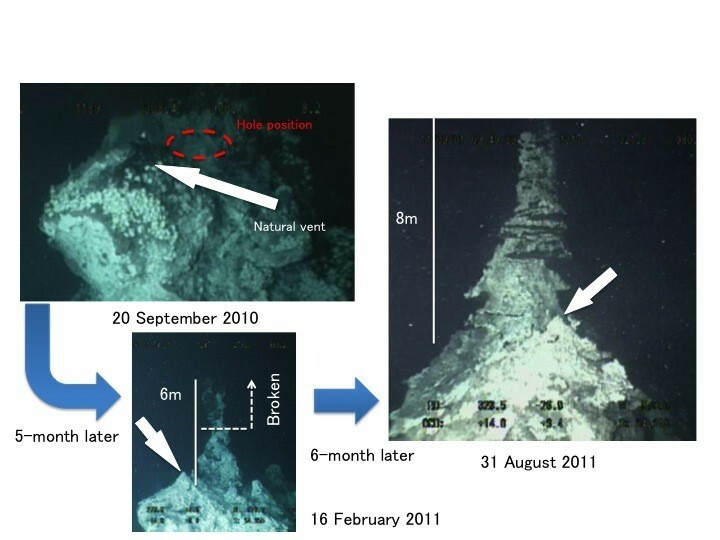 At the natural chimney site, drilling induced further artificial black smoker venting and a new chimney was formed, rising about 8 m in over 11 months (Figure 9). Artificially-produced hydrothermal chimney grew to about 8 m high in 11 months. Although one of the main targets of the expedition, finding the limits of life in a high thermal gradient zone, requires further investigation, drilling into a pumice-rich hydrothermal system discovered many new findings very useful for understanding the genesis of Kuroko ore. The artificial manipulation of large hydrothermal pools may also open a new technological frontier addressing submarine hydrothermal energy and ore production. These IODP expeditions to date all provide evidence of the wide range of applications the drilling capabilities of Chikyu, and support the utility of a riser-capable vessel applied to achieve basic science goals. As further evidence of the need for Chikyu’s capabilities in the new International Ocean Discovery Program (IODP), a meeting was held to discuss and plan Chikyu’s role in the new ocean drilling program. In April 2013, nearly 400 scientists and engineers from all over the world gathered in Tokyo to discuss the future science plans for the Chikyu (Chikyu + 10 Workshop) . The strategic approach to maximize the use of the Chikyu was the proposal to identify “flag ship” projects, to be promoted by involving a larger-scale community effort. Further technological improvements and innovations are required to achieve the scientific goals discussed by the participants. Data obtained through improved LWD, advanced analysis of cores, long-term borehole observatories, and seismic-geology integration would help open doors to new paradigms in understanding the active processes which have crucial roles in the evolution of this planet and shape the future of society. Asahiko Taira, Sean Toczko, Nobu Eguchi contributed equally to this work. We would like to thank Masaoki Yamao, Ikuo Sawada, Tomo Saruhashi, and the rest of the CDEX Operations Group. We would also like to acknowledge the contributions of Nori Kyo and the CDEX Engineering Group, Moe Kyaw Thu and the CDEX Logging Staff Scientists, lab officers and lab technicians from Marine Works Japan as well as Captains Yuji Onda and Yasushi Minoura, and the rest of the Mantle Quest Japan crew of D/V Chikyu. This paper was written based on the Axford Lecture of 2013 Asia Oceania Geoscience Society annual meeting given by the first author, A. Taira. We appreciate the AOGS for providing us this opportunity. We would also like to acknowledge the two reviewers, whose valuable comments and advice greatly strengthened this paper. Authors are all CDEX/JAMSTEC employees, therefore no competing interests. Eguchi, Toczko, and Kubo were staff scientists for several expeditions listed here. All authors drafted text or figures. All authors read and approved the final manuscript.